As the May 2018 deadline for General Data Protection Regulation (GDPR) compliance draws closer, organisations of all sizes will be investing in the products, services and solutions they’ll need to meet the new rules. While much as been written about IT installations, and the need to ensure tech infrastructure provides the necessary protection, there are numerous products in a dealer’s catalogue that can be sold to help protect data and information. “With the GDPR compliance deadline imminent it’s essential that organisations meet the new legal obligations. In order to limit the risk of data leaks it is imperative that businesses have in place a clear shredding and document management policy for employees to follow,” says Chris Gaskell, senior director, brand marketing, ACCO Brands EMEA. 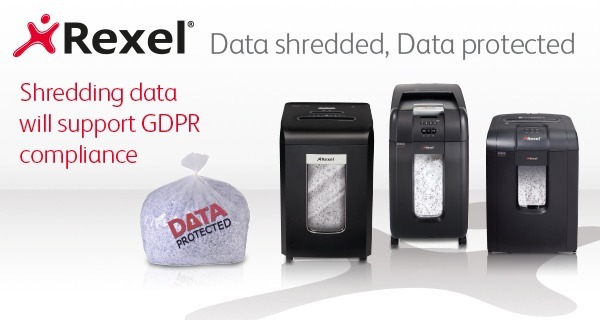 It’s also worth pointing out that GDPR rules stipulate requirements for visual security as well as paper-based security and it’s worth remembering that shredders are also important in all organisations when it comes to protecting sensitive data. When it comes to selling dealers can focus on the hefty financial punishments that are underpinning the regulations – and remind end-users that the regulations extend beyond digital breaches. “With many organisations focusing on digital breaches office product resellers have an opportunity to remind their customers about the importance of also protecting paper security,” Chris says. “Although there has been a significant drive towards the ‘paperless office’ a 2016 report by Epson pointed out that 83% of European businesses claim it’s an unrealistic goal given the large amount of essential documents still printed in a number of professions. “Employees regularly print documents that include personal and financial data which are often left lying around the office for others to find. Rexel’s machines are the ideal solution for business clients who want to take an active role in preventing data breaches from occurring. Ensured all internal sales teams have received training so that they are in a position to advise customers of the correct procedures and products. Written an article all about getting ready for the GDPR and made this available to VOW dealers through the VOW to Guide. An eShot entitled ‘Your 5 Step Guide to the GDPR’ was also sent out to raise awareness amongst VOW dealers and lists the products they need to sell. Protecting digital data is important, but so too is information held on paper. Dealers are well-placed to remind organisations of this fact – and to profit from it too. For more information on Acco’s GDPR-related products click here.